Orange Township’s Planning and Zoning Director Michele Boni displays the township’s new Comprehensive Land Use Plan. The township partnered with graduate students from The Ohio State University, who conducted surveys and compiled the data to create the plan. 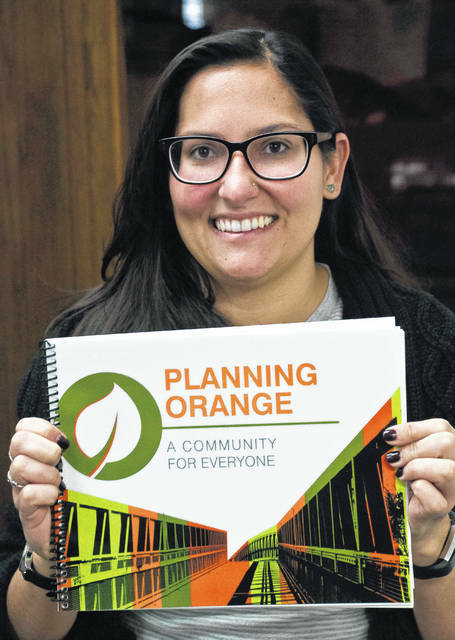 Orange Township, partnering with graduate students from The Ohio State University’s Master’s of City and Regional Planning program, has completed the update to its Comprehensive Land Use Plan. The last time the township updated the Comprehensive Land Use Plan was 2010. In four meetings with township residents, students discussed the strengths, weaknesses, opportunities, threats, and how residents perceived the future of the township. The final meeting was held Dec. 5 with the students giving the final presentation. Boni said that almost 500 survey results were returned and overall the project was a success. Boni said the plan still needed to be approved by the zoning commission and trustees before being implemented. She said the plan shows the methods used and the results, which are broken down into eight chapters. Boni said the balance comes in encouraging and attracting businesses offering higher-paying jobs. She said U.S. 23 has plenty of available space that could be utilized by higher-paying employers. However, Boni said as Evans Farm progresses it could drive commercial development to the Big Walnut intersection. She said she sees Evans Farm as the experiment on mixed-use areas and a driver for other types of development. Boni said the township is well connected when it comes to public utilities. Boni said the plan includes affordable housing to attract more of the service-level workers. She said it’s tricky to put in a plan because people perceive affordable as low-income. Boni said directional signage strategies were added by the graduate students. Boni said the directional signage will provide a better sense of identity for the township. She said the downside of the signage is, it draws attention and some people don’t want it. This entry was tagged Comprehensive Land Use Plan, Michele Boni, Orange Township. Bookmark the permalink.